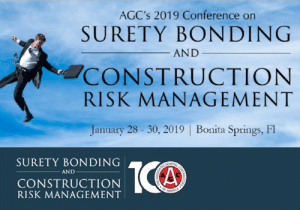 On Monday, January 28th, VERTEX CEO, Bill McConnell, will be presenting on the State of the Construction Industry at AGC’s 2019 Conference on Surety Bonding and Construction Risk Management in Bonita Springs, Florida. AGC’s annual Conference on Surety Bonding and Construction Risk Management focuses on the thought leaders in the field of construction risk management, including the construction, surety, insurance and legal professionals who continue to play such important roles. The 2019 conference is intended to serve and support everyone involved in surety bonding and/or the larger process of construction risk management. To learn more about VERTEX’s services to the surety industry, please call 888.298.5162 or submit an inquiry.